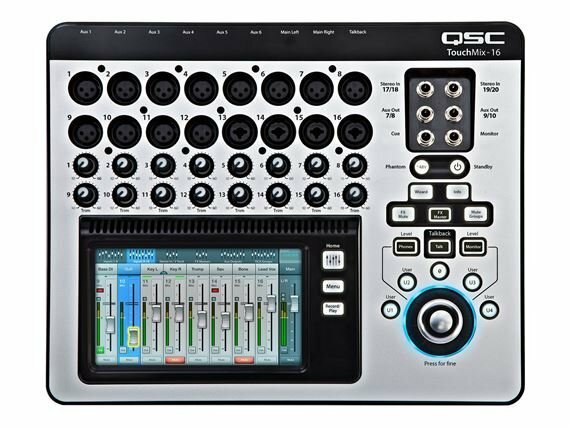 The new 20-channel TouchMix Digital Mixer from QSC is compact, affordable, easy-to-use and full of features for pro-grade musicians and production professionals. The QSC TouchMix-16 is the middle sibling to the flagship TouchMix-30 Pro and the TouchMix-8, sharing the same DNA that makes this family the new standard in digital mixers. 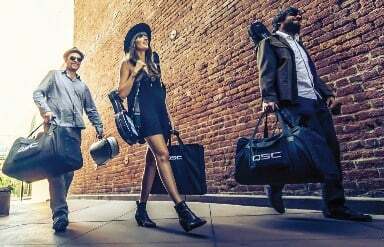 It offers just the right balance of power and portability, perfect for musicians, production professionals, and live performance venues. 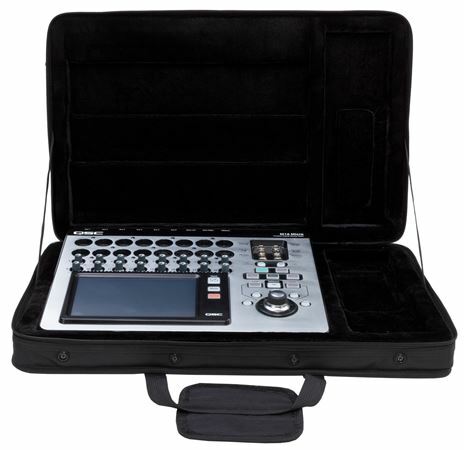 It features 16 inputs (12 Mic ,4 Mic/Line), onboard digital effects, processors, presets for all types of instruments, mixer scene memory locations, and direct to hard drive record/playback. Just like its siblings, the TouchMix-16 operates off of a modern, familiar, and intuitive multi-touchscreen interface, providing professional sounding results that are easily achieved by users of any skill level. More channels – Because of the new MP3 USB playback functionality, the TouchMix-8 is now a 14-input mixer while the TouchMix-16 improves to 22-input. QSC loudspeaker tunings are also present in Version 3.0, including presets for our new K.2 Series. To ensure that customers maintain the most current operating system for their mixers, Version 3.0 also provides a system check, offering direct download of updates when the mixer is connected to the Internet. The TouchMix DAW Utility is available for free download from the QSC website!The TouchMix DAW Utility is a software application for TouchMix owners who also use DAW (Digital Audio Workstation) software for music recording and production. It enables and simplifies two-way migration of digital audio wave files between TouchMix and DAW software. The TouchMix DAW Utility runs on Windows and Apple computers. This mixture is very easy to use and I recommend it to anybody pick one up you won't be disappointed. I've had it on multiple gigs already and it's changes my sound system all together. The perfect mixer for QSC officalandos! 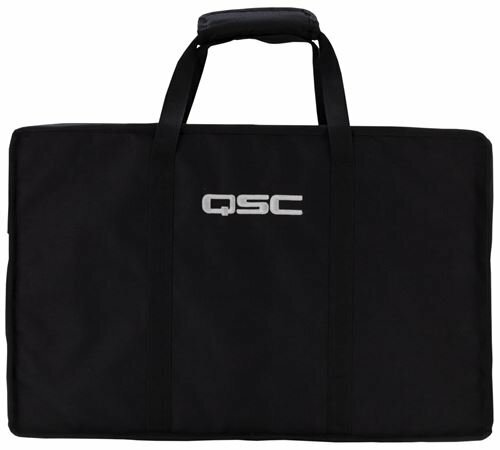 The QSC mixer is the ultimate mate to all the K speakers. Multi effects and ease of use makes this mixer a must buy. Light ,durable and incredibly high tech makes this mixer one of the best in the market.A perfect addition to the QSC family of speakers. The best investment I have done. I already have the Touchmix 8 and I love it. The 16 is everything and so much more ! Fast easy setup and so easy to use. You can't help but fall in love with it. The EQ's and FX's are easy to use and sound amazing. I love that I can save my settings so the next gig is a fast easy setup and all I need to do is make a walk around the room with my Ipad and make slight adjustments to complete my setup. I will never go without one. Yes the cost is up there but worth every penny ! I bought this thing thinking my brother knew all about it. So when It came down to using it and calling him on some advice , needless to say he didn’t know much about it. So he directed me to a rep from qsc and I literally learned how to use this thing over the phone. I had it on ten minutes and boom I was mixing a show!! Very impressed with the quality of this unit, and I now use it while I’m djing. I never knew how easy this baby was to use . The most awesome feature is the Fact that I can set it up next to the stage and walk around with my IPad and make adjustments!! It saved me money on a snake ! Buy it, you won’t rgret it. The preset function is a HUGE game changer, no more guessing . Has a setting for male and female vocals, guitars , kick drum. I have gained more knowledge about sound alone because of this thing and also more gigs because of how profesional it looks on my table. Thank you Qsc and especially American Musical!